I have written about my Lyra Deara and about Button, so it’s only fair that I devote some time to Cosmo. He IS one of the three of us and has been for over sixteen years. At the expense of falling into the trap of the “my cat is unique and the best” story, I’ll take the chance and sing his praises and brag a bit anyway. 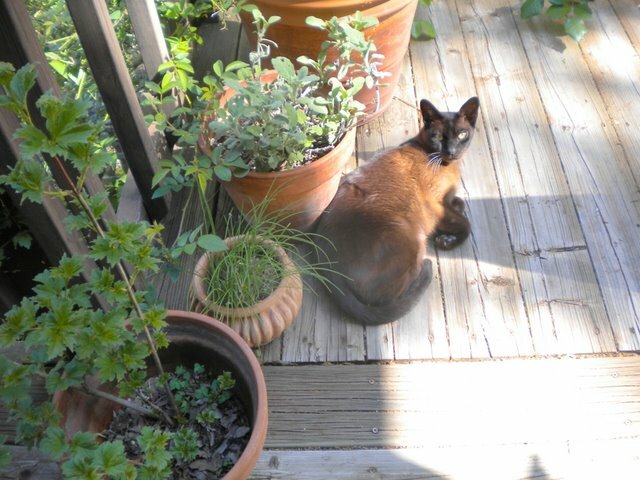 There have been a lot of cats in my life, starting with Pandora and Robin Goodfellow, then Bella and Neferkitty and Ram, Cleocatra, Magic and Esmeralda Paranoia, not to mention Button and Lyra Deara. And even Mr. Darcy who visited for awhile. It’s hard to say which ones we miss the most, but Ram and Magic and Lyra are right up there. 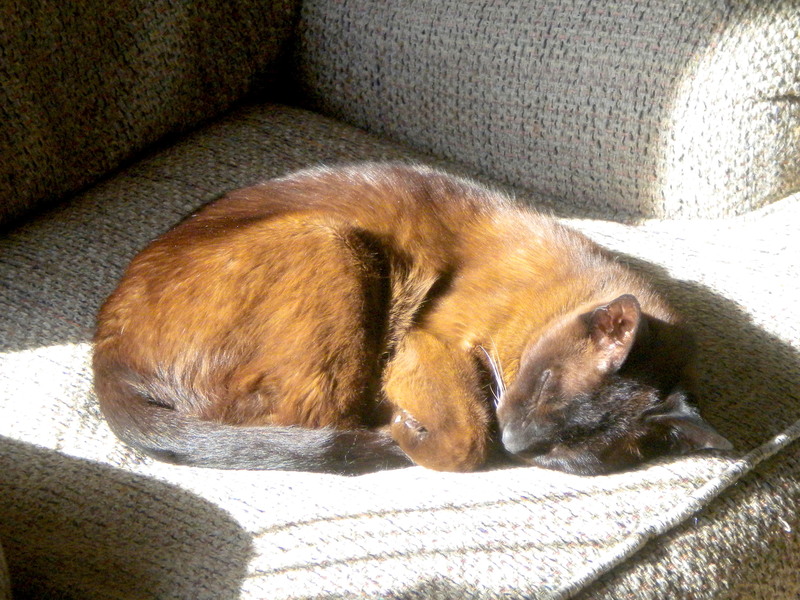 Robin and Darcy were big reds, Button a calico and Lyra a most likely “black burmese” and all the rest a type of “mese” – Siamese, Burmese, Tonkanese. It is a bit worrisome to think of hauling him across the country and he will not be a happy camper. Odd to think that as a kitten we picked him up at the breeders many miles from home, and instead of being content in the carrier, he immediately stood on his hind legs to look out of the window, until he got tired of that and stretched out on his BACK for the rest of the ride home. After that he jumped into the car for any chance to ride along. He has always considered me his litter mate I think, and found it great fun to run and leap on me with all four legs and then bound away. Especially fun when he could hit my head as I sleep or my side as I’m reading or otherwise engaged. Sometimes I would have to give him a time out and put him in the bathroom to make him stop. Once when he was young I wadded up a small piece of paper and threw it across the room, hoping to engage him in batting it about. But no. He picked it up in his mouth and brought it back and dropped it at my feet to throw again! And thus was born our many games of “fetch”. 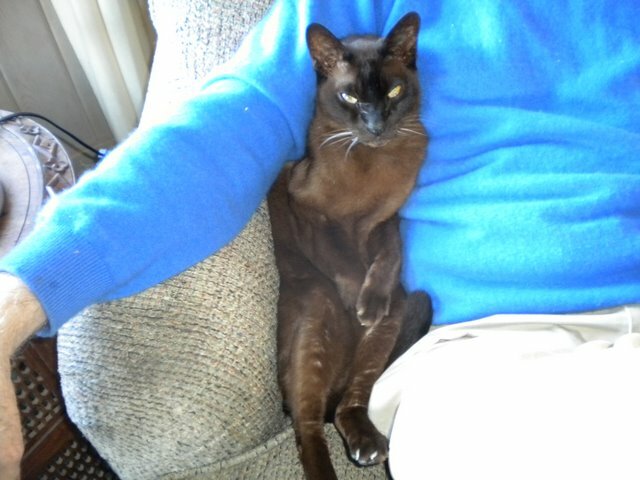 Well, one breeder did say that Burmese were the dogs of the cat world. Another game which he tried repeatedly to teach to Lyra, and that he still plays with me, is Tag. One of us sneaks around the furniture and runs out and swats the other and runs away. And then they’re “IT” and have to run and swat. I know. I know. Kind of an embarrassing picture, but what’s a litter mate to do. The best thing about Cosmo is that he has ALWAYS come when he is called. He could be way down the block when we lived in the city, or far across the neighbor’s field doing some wonderfully interesting thing and yet, come running at the sound of his name and three claps of the hand. Of course it didn’t hurt that he often got a dollop of Gerber’s Baby Beef for his effort. And maybe, come to think of it, it just might have something to do with the Gerber’s that he is happiest when he is carried about on one’s shoulder, just like a baby. Just until the past year when age has intervened, he in fact was wont to leaping from a sitting position up upon one’s shoulder. That was fine with us, but could be something of a shock to a stranger. There are two other traits which make him seem more human than cat. He sighs. Deeply. And at the appropriate times. And if he thinks there is someone in the yard who shouldn’t be there, he runs fast up the stairs to the landing and yells out sounds which I believe have never ever come out of a feline mouth. They’re hard to duplicate in print, but sound as if he was desperately straining to make words – “Arg, Oul, Err, Heg, Awl, Waa”! I hope he likes Mt. Faith.